Even the most ubiquitous public symbols have histories and, as such, can result in public debate over use and meaning. Recently, the rainbow has been at the center of public discussion. 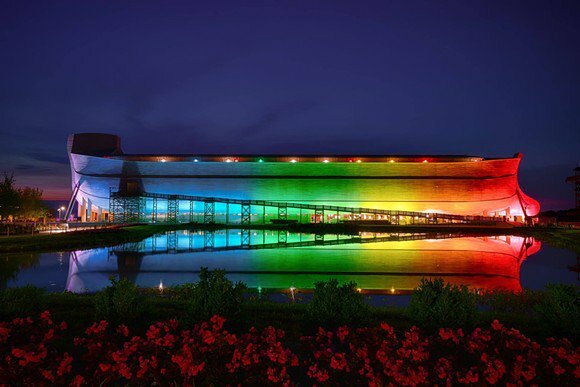 This week, Ken Ham of Answers in Genesis (AIG) broadcast that the Ark Encounter in Kentucky will be lit with a rainbow each night. He tweeted his logic for doing so, along with a photo, saying, “Christians need to take back the rainbow” because “God owns the rainbow.” This announcement comes shortly after widespread public debate over Facebook’s decision to make a “LGBTQ Pride” react available during the month of June. Ham’s claim of God’s ownership of the rainbow has been met with both ridicule from the LGBTQ community and support from Christians who want to #TakeBacktheRainbow. What may at first look like a grab for headlines on Ham’s part is in actuality tied to larger histories and debates about the public use of symbols as well as the acquisition and maintenance of political power. Navigating the histories of symbols and the groups that utilize them allows for a more complex understanding of why negative reactions may actually reinforce both groups’ worldviews. The rainbow flag is one of the most recognizable symbols of LGBTQ identity today. Gilbert Baker designed and collaboratively handmade the first rainbow flag in 1978 while living in San Francisco. In an interview with the Museum of Modern Art after their acquisition of the original flag, Baker explained that he conceptualized the flag “as a symbol … something that everybody instantly understands” that is also about “proclaiming power.” He elaborated that he intended the new flag to be a positive representation of the LGBTQ community, replacing the pink triangle originally assigned to gay persons by the Nazis. While that symbol had been reclaimed by the 1970s, Baker saw the need for the community to develop its own symbol and was motivated in part by the activism of the day. To Baker, the rainbow was a logical choice because “it really fits our diversity in terms of race, gender, ages, all of those things. Plus, it’s a natural flag—it’s from the sky!” This assertion that the rainbow is a fitting symbol because it promotes diversity and is natural is in direct opposition to Ken Ham’s interpretation. Ken Ham is perhaps best known for being the public face of Young Earth Creationism in the United States. He is the President and CEO the organization Answers in Genesis, which runs both the Creation Museum and Ark Encounter theme park in Kentucky. Ham is no stranger to holding positions counter to mainstream belief and seems to thrive on generating controversy as a way to publicize those beliefs. The announcement about the rainbow nighttime display at the Ark Encounter is only the most recent and most public attempt to promote the goal of taking back the rainbow from the LGBTQ community, a position he has publicly written about since at least 2007. For Ham, the rainbow is inextricably linked to the story of Noah and represents “a covenant of grace” and is a “symbol of Christ Himself” that is “sadly…even used on a flag for the gay and lesbian movement.” It is important to note the idea of reclaiming the rainbow may not have originated with Ham, and support for this cause is found on a variety of conservative news sites (for example here and here). What is key here, however, is that this idea has now entered mainstream conversation thanks to Ham’s ability to generate mainstream media coverage. This isn’t the first time in 2017 the rainbow has generated controversy. In June, Facebook announced the availability of a Pride/rainbow reaction to celebrate Pride Month. Users had to opt in to use the reaction by liking the official Facebook LGBTQ page, but it nonetheless garnered outrage from those who viewed this as Facebook promoting homosexuality. Some Christians petitioned that Facebook should add a Cross reaction, but ultimately Facebook declined. With AIG’s rainbow at the Ark Encounter we see something different than the conservative Christian reaction to the Facebook rainbow. For Ham and others, it’s not enough to have equal access to both LGBTQ (rainbow) and Christian (Cross) symbols; it’s necessary to publicly reclaim symbols like the rainbow. Both the LGBTQ community and conservative Christian groups are aware of the power of symbols and, as such, this AIG announcement allows both groups to revisit their historical claims over the rainbow. For LGBTQ groups, controversy over the rainbow serves as a reminder that conservative Christians are often the most opposed to LGBTQ rights as witnessed recently in their fighting against marriage equality and promoting so-called “Bathroom Bills.” For conservative Christians like Ken Ham, publicly rejecting the LGBTQ community’s claims over the rainbow and facing ridicule for doing so bolsters his position that “Christian persecution is on the rise.” In recent arguments about the rainbow, the reactions by both groups involved allow them to claim a marginal position in the world, thus reaffirming their continued involvement in disputes over public symbols like the rainbow. Sarah “Moxy” Moczygemba is a doctoral student at the University of Florida studying Religion in the Americas with a focus on Catholicism in the United States. She can be found on twitter @s_moxy. This entry was posted in Guest Contributor, Politics and Religion, Religion and Popular Culture, Religion and Society, Religion in the News, Sexuality and Gender, Theory in the Real World, Uncategorized and tagged american religion, Answers in Genesis, Ark Encounter, Bathroom Bills, Belief, Bulletin for the Study of Religion, Christian Cross, Christian persecution, Christianity, Creationism, Facebook, Gilbert Baker, Ken Ham, LGBTQ, Marriage Equality, MOMA, politics, Pride Flag, Rainbow, Rainbow React, Religion, religion and politics, Religion and Society, religious studies, Sarah "Moxy" Moczygemba, study of religion, symbols. Bookmark the permalink.